A Joe Gibbs Racing Toyota has won 11 of 22 races this season in the NASCAR Sprint Cup Series, and the team is heavily favored in Saturday’s race at Bristol Motor Speedway. A Joe Gibbs Racing Toyota has won 11 of 22 races this season in the NASCAR Sprint Cup Series, and the team is heavily favored in Saturday’s Bass Pro Shops NRA Night Race at Bristol Motor Speedway in Bristol, Tennessee. After Friday’s practices and qualifying, the five Gibbs cars look more formidable as a unit than they have all season. Las Vegas sports books already had placed high expectations on them, but Friday’s display widened the gap even more between them and the rest of the field. 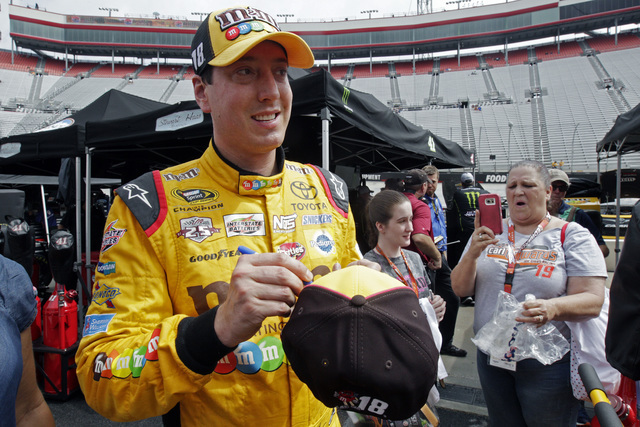 Las Vegan Kyle Busch, the 7-2 favorite and five-time winner on the high-banked, half-mile concrete layout, posted the fastest lap in both of Friday’s practices. He qualified third and looks well equipped to win for a series-leading fifth time this season. 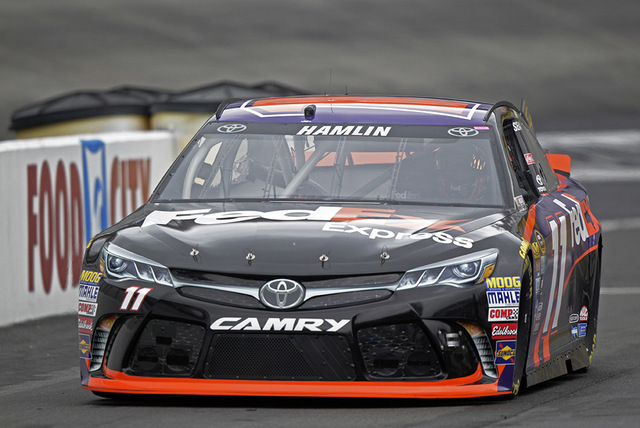 Teammate Denny Hamlin posted the best 10-consecutive lap average in both sessions, showing he will be faster than most on longer runs. He also set the track record at 133.668 mph during the second round of qualifying, and was second-fastest in the final round of qualifying. He will start second. Those two performances alone would establish the team as a major force, but there’s even more data supporting Gibbs as the team to beat. The pole position went to Carl Edwards, who won at Bristol in April from the pole, leading 276 laps. It was his fourth Bristol win and second in the past five races there. Gibbs driver Matt Kenseth has four Bristol wins, including two in the past six starts, and will start fifth. That gives Gibbs four of the top five qualifiers — Ryan Blaney will start fourth in a Ford — and Martin Truex Jr., who uses JGR equipment, qualified seventh. In the 111 Cup races at Bristol, 65 have been won from a top-five start position. • Joey Logano (15-2) has won the past two night races at Bristol and has the best case to derail JGR. He has only one win this season after leading the series with six in 2015, but has been competitive with nine top-five finishes. • Kurt Busch (20-1) didn’t look great in practice — his best was 13th in the first session — but he’s a five-time winner at Bristol. He’s using a chassis that finished third at Bristol in April and fifth at Dover in May. Bristol is like no other track, but Dover’s one-mile, high-banked concrete layout requires a similar setup for crew chiefs. • Chase Elliott (18-1) had 11 top-10 finishes in the first 15 races of his rookie season this year, but has been 13th or worse in his past seven starts. He finished fourth at Bristol in the spring and third at Dover. He’s the best candidate to prevail from Hendrick Motorsports, which hasn’t won since the fifth race of the season at Fontana. Micah Roberts, a former sports book director, has been setting NASCAR lines in Las Vegas since 1994. Follow on Twitter @MicahRoberts7.